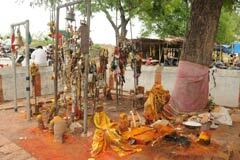 The Poochoridal festival begins on the first Tuesday following the new moon day in the month of Chithirai – April-May. The main festival is then followed for thirteen days from the next Tuesday in a grand manner drawing a huge crowd. Mount worship (malai Vazhipadu), Wedding festival with the deity gracing from a silver horse and rath (car). The temple is opened during these days with pujas. It is festivity in the temple on Tamil and English New Year days, Aadi perukku in the month of July-August, 10 day Purattasi Navarathri in September-October, Iypasi Deepavali in October-November, Karthikai deepam in November-December, Margazhi day and Vaikunda Ekadasi in December-January, Thai Pongal falling almost on January 14, Thai Poosam in January-February and Masi Shivarathri in May-June. The temple has the Sri Chakra installed by His Holiness Swami Brahmmendra. The temple is open only on Mondays and Fridays when pujas are conducted and during the festival days. The temple is not opened on other days. The temple will be opened at 8.00 a.m. Abishek to the deity is performed at 11.00 a.m. and adored with gold coverings. 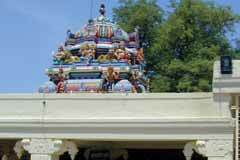 The temple is open till 8.00 p.m. these days for public darshan. 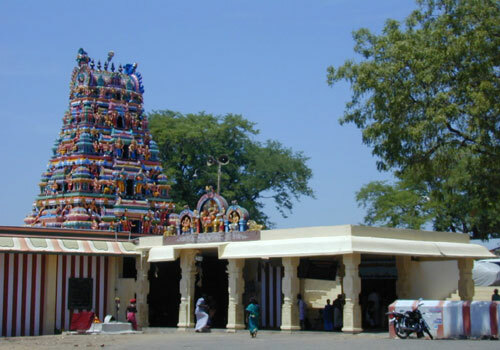 Sri Madhurakaliamman Temple, Siruvachur, Perambalur district. The beautiful temple is situated at the village limits surrounded by mounts, lake, tanks and green fields blowing a gentle and a cool breeze. This was renovated by Kulothunga Chola. A powerful deity protecting the people. Aiyanar is the guardian deity. Majority of the devotees pray for wedding and child boon. It is the staunch faith of the people that solution is available from Mother Goddess for any problem as loss of things, ailments and minor bodily problems, litigations, business matters etc. The Mother is very merciful and powerful taking care of Her devotees. 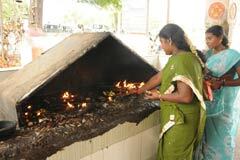 Lighting the flour lamp Maa Vilakku) is the main form of prayer commitment for Siruvachur Kaliamman. This is offered for chest, hands and legs. Angapradakshinam – rolling round the temple. Devotees also perform milk abishek, pujas and organize poor feeding. As flour lamp lighting is the main form of prayer commitment in the temple. The devotees neither buy the flour outside nor bring it prepared from their homes. They bring only rice, soak it in the water and then pound it in the temple premises only. They add ghee and prepare the paste for making the lamp. These lamps are placed before the shrine of Shakti. The temple has special space for pounding the rice to make the flour. 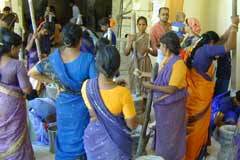 There are also people for hire to help devotees pounding the rice. 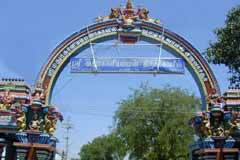 It is said that the name Madurai Kaliamman has later changed as Madurakaliamman. The idol is about 4 feet tall facing northward. She has weapons and an Akshayapatra – a vessel always full of food – in her four hands. The mother is sitting with one leg bent and the other on the lion, the vehicle of Shakti. The absence of demon under the feet of Kaliamman as usually found in Kali temples denotes that the deity is all merciful and not furious. According to some hearsay stories, Kannagi, heroine of Cilapathikaram calmed herself down in this place after her departure from Madurai. Chelliamman is the deity of Siruvachur. A tantric, using his powers controlled the deity and was using Her for his evil doings. While visiting this place, Madurai Kaliamman sought a space from Chelliamman to stay here for a night. Chelliamman told her of her slavery under the tantric. Madurai Kaliamman destroyed the Tantric and rescued Chelliamman of her captivity. Surprised by the power of Madurakaliamman, Chelliamman said that she would move to the Periaswami mount nearby and asked her protector to stay in Siruvachur itself but demanded that the first respect (Mudal Mariyadai) should be offered to her. Accordingly during the puja times, the Arati is shown to the mount where Chelliamman stays. Then pujas continue in the main temple here. 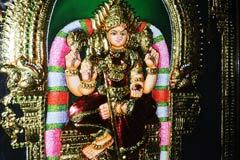 As Madurakalaiamman came to Siruvachur on a Friday, She is granting darshan to the devotees on Mondays. Following this story, the temple is open only on Mondays and Fridays. It is said that the deity stays with Chelliamman on other days. Siruvachur is 14 km from Tiruchi on the Tiruchi-Chennai National Highways.